Easter dinner calls for a nice juicy ham and this one, decorated with pineapple and cherries, is worthy of the occasion. The cola and keeps the ham nice and moist without making the meat too sweet. Preheat oven to 325 degrees F. Place the ham in a large roasting pan so that it doesn’t touch the sides of the pan. Using a sharp knife, score the ham in a criss-cross pattern, with the lines about 1 inch apart, cutting about 1⁄4 inch deep. Pour the entire quantity of sugar over top the ham and pack it firmly all over the ham with your hands. 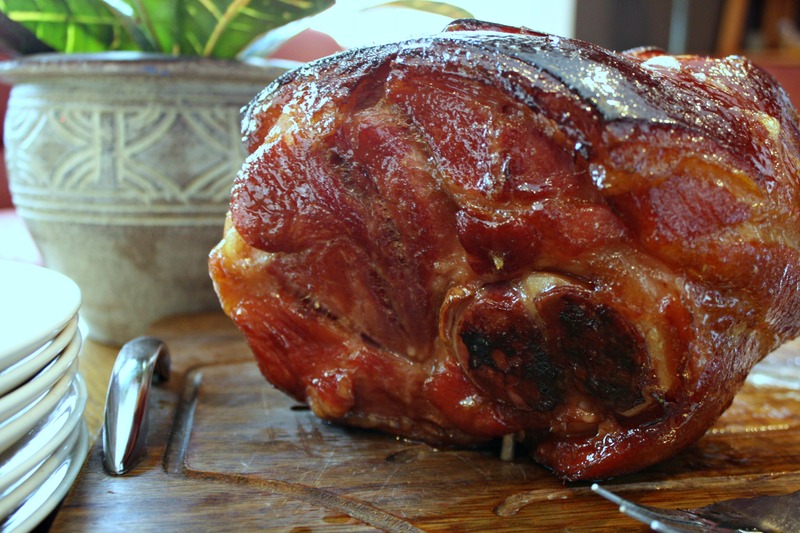 Place the ham in the preheated oven and bake until the sugar begins to melt, about 30 minutes. Remove the pan from the oven and pour the can of Coca-Cola directly onto the ham. Baste the ham with some of the cola and sugar pooled in the bottom of the pan. Bake for another 20 minutes. Combine one cup of the pineapple juice from the can of pineapple rings with the grape juice. Remove the ham from the oven and pour over the combined juices. Baste again with the liquid from the bottom of the pan. Return the ham to the oven and continue to bake for 15 minutes per pound, or until it reaches an internal temperature of 160 degrees F. Baste every 20 minutes with liquid from the pan. About 20 minutes before your cooking time is finished, remove the ham from the oven and decorate it with pineapple rings and cherries, securing the fruit with toothpicks. Baste thoroughly before returning the pan to the oven. Let the ham rest for 10-15 minutes after removing from the oven. Cut into slices and arrange on a serving plate with pineapple and cherries and drizzle with excess liquid from the pan.